Labor has taken its campaign against Alabama’s racist, anti-Hispanic, anti-immigrant law international. The Steelworkers are pressuring the state’s most-influential employer – the automaker Daimler-Benz – to publicly oppose Alabama’s law. And the Service Employees filed a formal complaint against Alabama, and the U.S. government for lack of action, with the International Labour Organization, to try to win world pressure for the law’s reversal. The Steelworkers’ campaign, aided by La Raza Unida and a wide-ranging coalition of civil rights groups, may have the greater potential. That’s because, USW Vice President Fred Redmond says, Daimler-Benz swings great corporate weight in the state. Where the automaker leads, he says, other Alabama businesses will follow. The Service Employees sent its legal case to the ILO. It said the Alabama law violates two ILO conventions, as well as international labor rights standards. But the ILO has no enforcement power either to make Alabama repeal the law or force the U.S. government to take stronger action against the state. Redmond and his colleagues presented the case against Alabama’s law, HB56, to Daimler’s board, officers and shareholders at the firm’s Apr. 4 stockholders’ meeting in Berlin. Daimler-Benz’ Alabama plant, which makes Mercedes-Benz vehicles for the U.S. market, employs 1,500 workers and generates a $10 billion economic impact. They also reminded Daimler-Benz brass the auto firm has signed an international code of corporate conduct on labor rights, and the Alabama law flunks those standards. HB56, pushed through the heavily Republican Alabama legislature by a right-wing governor, brought national notoriety to the state for its racism and open prejudice against anyone Hispanic. It’s also triggered mass marches and a repeal movement inside and outside the state. The law criminalizes undocumented workers by forcing anyone whom police stop to immediately produce proof of the right to reside in the U.S. or face immediate arrest, detention, and deportation. It also outlaws the workers’ ability to sign contracts, turns school principals into enforcement agents quizzing kids about whether they and their parents are legal, and says anyone aiding an undocumented worker is a criminal, too. Alabama’s law is so bad, says U.W. Clemon, a retired federal judge from the state, that it recalls the days of “states’ rights,” when Southern states used that doctrine to justify Jim Crow laws and other repressive measures against Blacks. “It takes me back to 1857 and the Dred Scott decision, when the Supreme Court said Blacks could not be citizens” because of their color, he said. 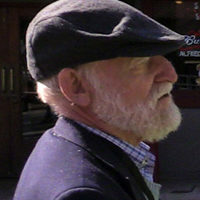 Now that’s applied to Hispanics, the civil rights veteran told an Apr. 4 Center for American Progress session. “We know the reason [Daimler-Benz] located there in Alabama is because it has some of the worst labor protections in the U.S.,” Redmond said by telephone after the presentation in Berlin. Stockholders applauded. Business and legislative leaders in Alabama “told us that if Daimler-Benz speaks up, the law would be changed,” he added. “We’re encouraged they’re in discussions” with other businesses and with state and federal Alabama lawmakers about next moves, Redmond said of Daimler-Benz. But, he added, “that also implies they’re waiting for federal legislation” on immigrants’ rights – including working without fear of deportation. Such a law is unlikely. “And they did not call for its repeal, and that is disappointing to us,” Redmond said, adding the union and its allies will keep the pressure on the automaker. SEIU accused the U.S. government of breaking two international labor rights conventions on freedom of association by not acting strongly against HB56. 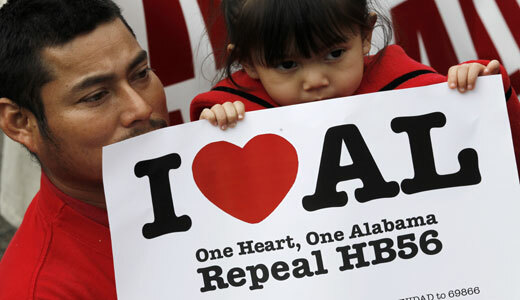 The Obama administration sued in federal court in Alabama to overturn HB56. The judge there threw out parts of it. SEIU told the Geneva-based ILO on Mar. 29 that HB56, one of five enacted anti-Hispanic state laws, hurts all Alabama workers and hampers union organizing, too. The other enacted laws, all part of the GOP-business crusade to trash workers’ rights nationwide, are in Utah, Arizona, South Carolina, and Georgia. If the ILO rules for SEIU and against the U.S., the ILO can urge the U.S. to fix labor law violations, but it can’t force the federal government or Alabama to do so. SEIU told ILO that HB56 forced families to flee the state in fear. SEIU also said unions can’t organize – organizers would be criminals for contacting undocumented workers – and workers can’t get paid, even if they’re covered by a union contract, because of the law’s bans on signing and enforcing contracts with the undocumented. “The fact that the violations are the work of an individual state does not insulate the U.S. from responsibility,” SEIU President Mary Kay Henry and Secretary-Treasurer Eliseo Medina wrote in their cover letter to the ILO. They called the administration’s anti-HB56 actions “simply insufficient to protect these workers and our trade union now, or into the future, without a deeper commitment to federal legislative reform.” U.S. inaction let states flagrantly violate international norms, SEIU’s case concluded.